This is the summary of consumer reviews for Naturevibe Botanicals Organic Premium Moringa Green Leaf Powder for Weight Loss. The BoolPool rating for this product is Good, with 3.90 stars, and the price range is $12. Consumers swore by the health benefits of Naturevibe Botanicals Organic Premium Moringa Green Leaf Powder. 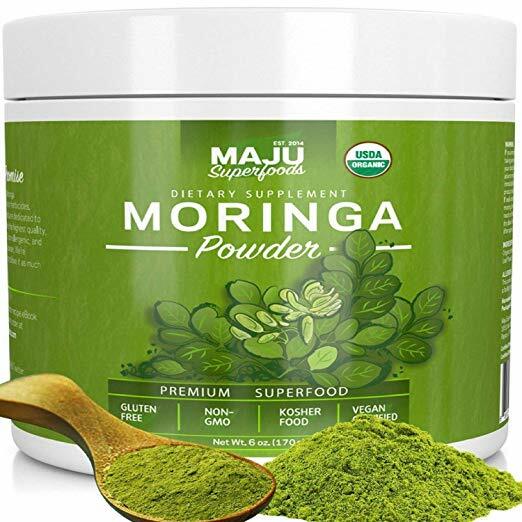 They believe moringa powder helped them with all sorts of medical stuff like inflammation, breastfeeding, and even asthma. The most common testament was the green leaf powder's energy boosting qualities. Many customers mixed it in their morning fruit smoothies as a pick-me-up for their day. But this natural vitamin supplement does not need to be mixed solely with smoothies (though many do so to mask the strong flavor). Some reviewers mixed the moringa powder in their Greek yogurt since yogurt has a pretty powerful flavor of its own. Others also recommended mixing the powder in certain soups. The hearty flavors of the broth may mask the flavor while the various herbs may actually accentuate the leafy green taste of the moringa. Reviewers also thought they felt fuller for longer. Their stomachs were not grumbling for a mid-morning snack or an early lunch which works great for those counting calories. A word of caution to new consumers, Naturevibe Botanicals Organic Premium Moringa Green Leaf Powder may have some detox qualities. One reviewer believes the vitamin supplement flushed their system rather abruptly which can be dicey if you are far away from the bathroom. Otherwise, consumers noted faulty packaging from Naturevibe Botanicals. While the product promotes a resealable bag, many reviewers struggled to reseal. This meant their purchase lost its freshness quicker than anticipated. You might want want to consider purchasing some airtight containers. 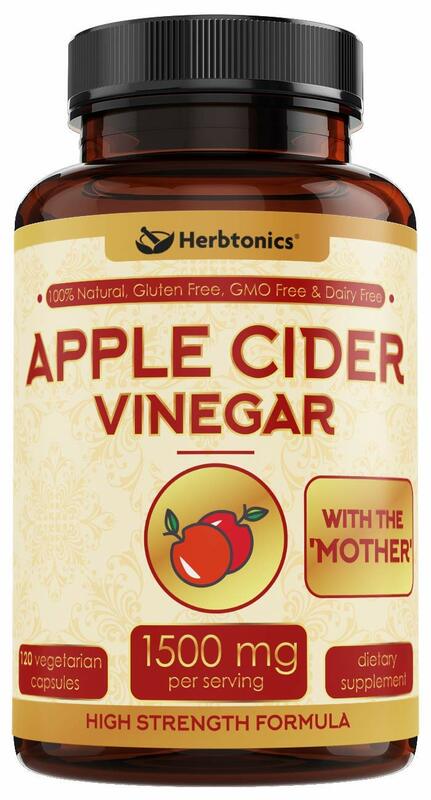 Gives you energy and helps with inflammation. I found straining it helped somewhat. Maybe it helps with weight of packaging?. Has been helpful with my asthma!. I'm not sure exactly yet, but I'm hoping it'll break loose the bacteria and help me lose more weight. I know it's full of vitamins and antioxidants, but I barely made it to the restroom after my bike ride. Not even sure how many mg that's. But have noticed an increase in how full I feel and baby isn't upset wanting more. Natural product, so definitely worth more than non-organic products. Thanks for this wonderful product. I'm very happy with my purchase.. The ziplock on package doesn't work. How are you suppose to seal and keep product fresh!!!?? I received this product, and upon opening the box, the bag was open with product wastes upon my other order all inside the box. Wondering is this safe or was it used? No way to tell if the product was beneficial...it tasted so bad I couldn't use it. The only downfall was the packaging (hence 4 instead of 5 stars): resealable bag was a flop; wasted quite a bit of product due to packaging and made a mess. This purchase of moringa I loved, It's a very green color. It looks fresh. 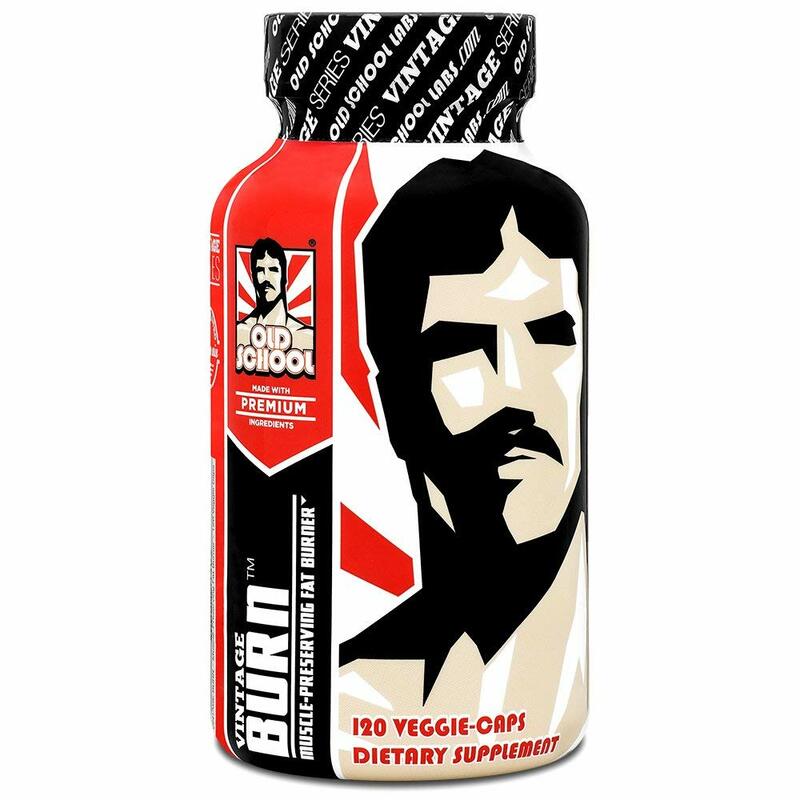 I've only just started using this product, but already feel an increase in energy and mood. The smell is slightly off-putting, but I thought it tasted like unsweetened tea which I love! You'll adjust to the taste eventually. 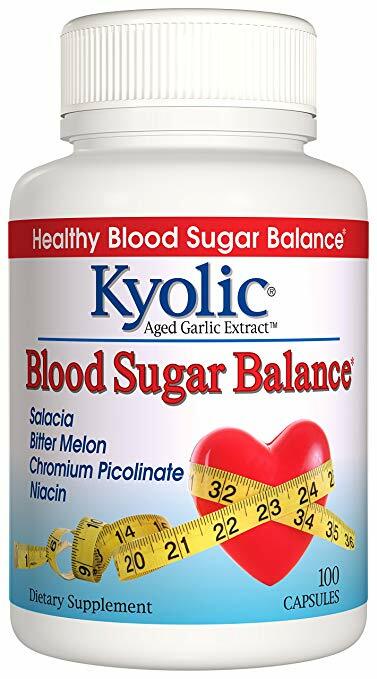 I higly recommended this product for health benefits. I use it every day in my morning smoothie, and it blends well. I tried it with my smoothie. Another product that a friend recommended. It can be added on your soups and smoothies. Taste wise, by itself I wouldn't drink it, but mixed in smoothies it's great. I add to my smoothies in the morning and truly notice a difference in my energy. The flavor was good and blended well into the smoothie I made. I've been taking 1tsp in th morning in my nutriblast smoothie and feel the difference. I mixed it with my smoothie and I could barely taste it. Lots of product for a fair price. Product has good color, texture and taste. So far this product is amazing!!! Great product at a great value. 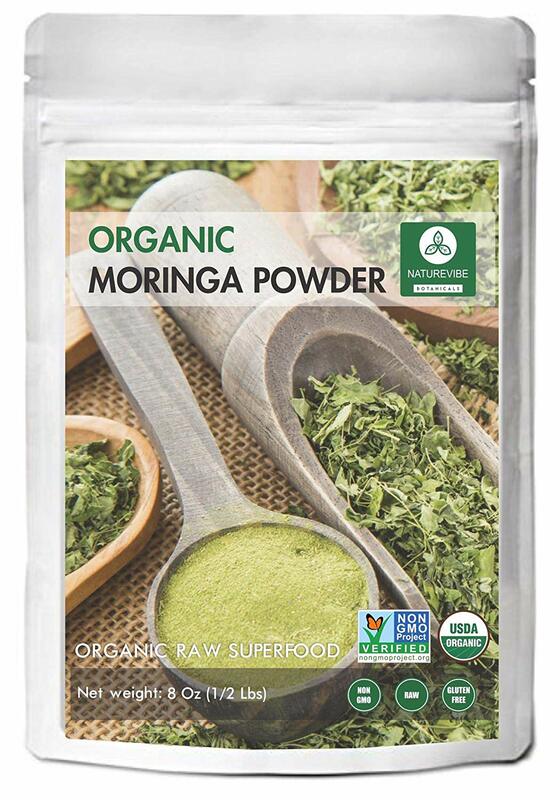 Organic Moringa leaf powder without any chemical smell. 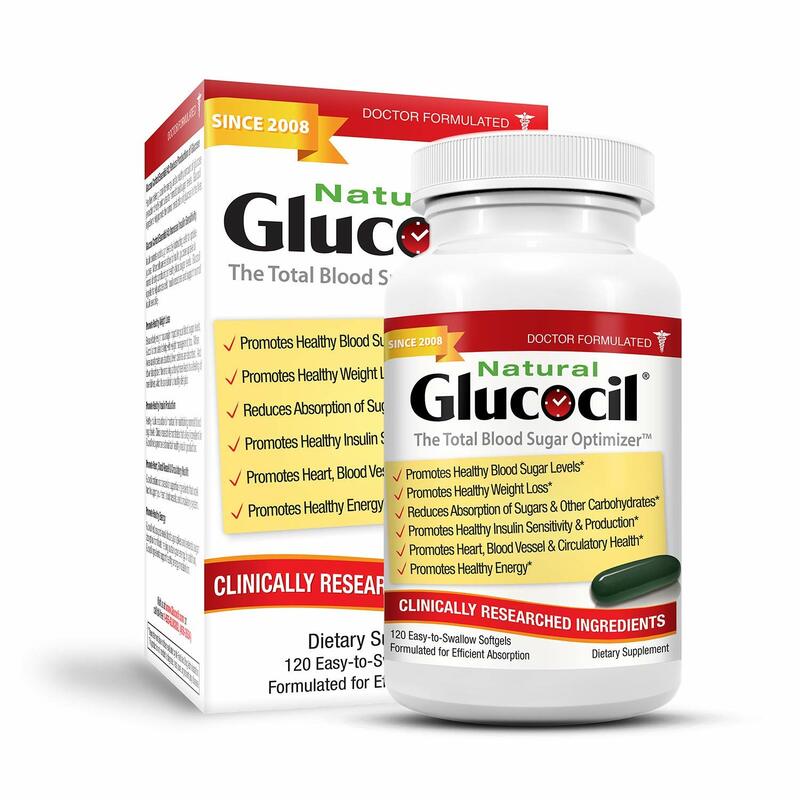 Good price and I like the product very well. Thank you Nature Vibe for a great product! 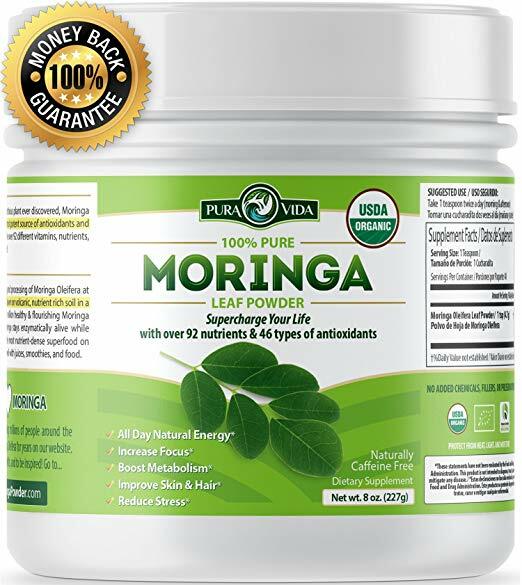 I've been buying Moringa from Whole Food for a while now; however, when I received this product, it was mind-blowing. The quality looks very clean. You can see immediately that is a good quality product. It's from India, so you know it's 100% organic. It mixes well in my smoothie and doesn't impart any strange taste. I mixed this in a smoothie with fruits and plain greek yogurt, and it tasted fine. Smells fresh, tastes horrible, just what I expect from moringa. I put this in my smoothie and can't taste it!. Nasty taste, but does the job. It tastes pretty terrible, very sour and bitter. 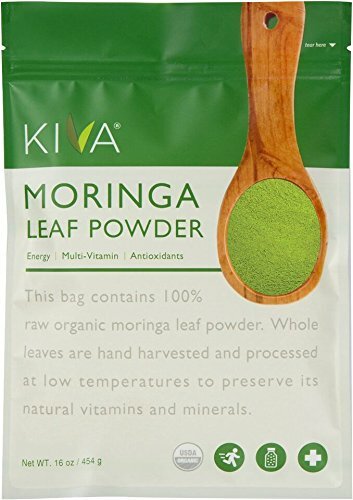 Organic Premium Moringa Green Leaf Powder (1 Lb), Non GMO Verified, Raw Superfood. Rich in Vitamin, Calcium, Magnesium, Iron, Protein | Energy, Immunity, Detox, Weight Loss.